Houses & Homes VA: Did you ever wonder how much the President of the United States really gets paid? Did you ever wonder how much the President of the United States really gets paid? As you already know, our salary (if not self employed) is comprised of much more than just how much money we see in our paycheck. Various benefits and other perks must also be considered when trying to decide exactly how much we make at any given position. As of January 1, 2001, the president’s annual salary was increased to $400,000 per year along with a $50,000 allowance for expenses. To many of us that seems like a very low salary considering what some of the top paid executives in the private industry are capable of pulling down each year but the president enjoys benefits unlike any private CEO can ever hope to enjoy. One example would be the White House Medical Unit that was created in 1945. This unit is tasked with providing "worldwide emergency action response and comprehensive medical care to the president, the vice president and their families." The entire staff is composed of 3 – 5 military physicians, medical assistants, nurses and medics that are available 24/7. The medical unit is headed by the president’s personal physician whom along with key members are always with the president whether he is in the white house or traveling halfway around the world. Then, of course, there is the protection of the Secret Service. The true budget of this agency is classified but one can imagine the incredible amount of money that is required to protect the most powerful leader in the world. Also entitled to protection are the spouses of U.S. presidents but oddly, I didn’t find anything specifically related to children of the president. Anyway, it’s fair to say that the immediate family of the president is entitled to the protection of the Secret Service. After a president has completed his term(s) in office he will receive protection as long as he lives. His surviving spouse is entitled to the same unless she remarries. 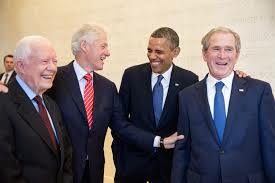 The pension of each former president is currently set at $201,700 annually and yes, it is taxed! Former presidents as well as their spouses, widows and minor children are also entitled to treatment in any military hospital if so desired but it is not free. So far I agree with all of these benefits for our leaders but there is one that I question. Apparently Congress is able to allocate funds to former presidents and vice presidents to help, and I quote, “facilitate their transition to private life”. These monies can be used to provide suitable office space, pay staff members and other related expenses. This is one perk that I must say I don’t fully agree with. When President George H.W. Bush and Vice President Dan Quayle were leaving office at the end of their terms they received a combined total of $1.5 million for their “transition expenses”. That seems a bit much to me. So how much does the president really make during an average 4 year term? First of all there are many other perks that the president enjoys while in office including an entertainment budget, a travel account, even an “unanticipated” expense account. Not surprisingly I could not find any exact totals for the actual cost of a U.S. President during his term in office but the cost is clearly in the millions.